In May 1775, with Redcoats once again storming Boston, the Second Continental Congress convened in Philadelphia. Still, in May of 1775 the majority of delegates were not seeking independence from Britain. Only radicals like John Adams were of this mindset. In fact, that July Congress approved the Olive Branch Petition, a direct appeal to the king. The American delegates pleaded with George III to attempt peaceful resolution and declared their loyalty to the Crown. The King refused to receive this petition and instead declared the colonies to be in a state of rebellion in August. Insult turned to injury when George ordered the hiring of Hessian mercenaries to bring the colonists under control. Americans now felt less and less like their English brethren. How could their fellow citizens order a band of ruthless, foreign goons? The moderate voice in the Continental Congress was dealt a serious blow. Congress was moving towards declaring independence from the British Empire in 1776, but many delegates lacked the authority from their home governments to take such an action. Advocates of independence in Congress moved to have reluctant colonial governments revise instructions to their delegations, or even replace those governments which would not authorize independence. On May 10, 1776, Congress passed a resolution recommending that any colony lacking a proper (i.e. a revolutionary) government should form such. 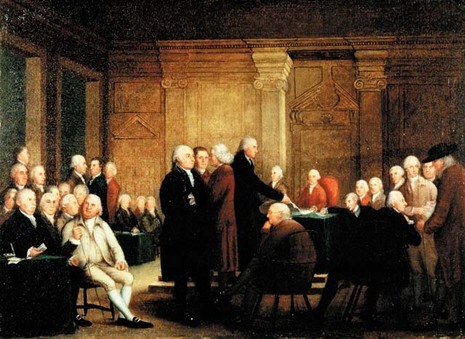 On May 15 Congress adopted a more radical preamble to this resolution, drafted by John Adams, in which it advised throwing off oaths of allegiance and suppressing the authority of the Crown in any colonial government that still derived its authority from the Crown. That same day the Virginia Convention instructed its delegation in Philadelphia to propose a resolution that called for a declaration of independence, the formation of foreign alliances, and a confederation of the states. The resolution of independence was delayed for several weeks as revolutionaries consolidated support for independence in their home governments. Congress finally approved the resolution of independence on July 2, 1776. Congress next turned its attention to a formal explanation of this decision, the United States Declaration of Independence, which was approved on July 4 and published soon thereafter. The Continental Congress was forced to flee Philadelphia at the end of September 1777, as British troops occupied the city. The Congress moved to York, Pennsylvania, and continued their work. The Second Continental Congress was presided over by John Hancock, who replaced the ailing Peyton Randolph, and included some of the same delegates as the first, but with such notable additions as Benjamin Franklin and Thomas Jefferson. Joseph Galloway, the Pennsylvania conservative, was not in attendance. All of the colonies sent delegates, although the Georgia delegation did not arrive until fall. As time passed, the radical element that included John Adams, Samuel Adams and Richard Henry Lee began to eclipse the more conservative faction represented by John Dickinson. Nonetheless, many of the delegates expected at the outset, that the rupture between colony and mother country would be healed.